Mike’s show is highly interactive with his audience. He is very comfortable coming off the stage and mingling with the audience. 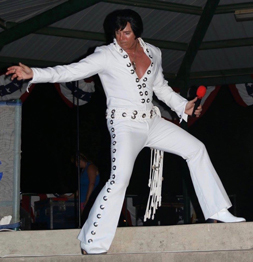 His passion for authenticity in his mannerisms, voice and persona are a key reason why Mike was voted the top Elvis in Central Texas for 6 straight years. Mike works hand in hand with his clients to design an Elvis show or appearance specifically tailored to their event. The client always has input to the outfits he wears and the songs he sings. Mike loves to share fun Elvis stories in between songs to give interesting insight to classic Elvis songs or stories about Elvis himself. Having a Las Vegas themed party or Casino Party? Mike can provide classic Vegas music to create the perfect “vintage Vegas” atmosphere while he is not performing. In many cases, this eliminates the added cost of a DJ at your event. Also available: 8’ x 10’ fabric Vegas-themed backdrop and props for great photos with Elvis. No other ETA in Texas offers this! If you’re just looking for a guy with sideburns in a jumpsuit, Mike is NOT the right choice. But if you’re looking for an authentic, intelligent, passionate Elvis Tribute Artist that will give your guests unforgettable memories of the King of Rock N’ Roll, he is the best choice in Texas!